For several years I’ve been trying to piece together the history of the US Army’s lensatic compass. In an earlier post on this blog we discussed the various types of compasses and a bit of the developmental history that can be inferred by viewing the examples in my collection. However, there was (and still is) very little solid history on the development of the lensatic compass available on the web. For an item as ubiquitous as this compass the lack of historical data seems a odd. The development and usage histories of many other items of WWII-era equipment are well documented. Take the M1 Garand for example. Collectors can discuss in detail every single part on that rifle and can accurately date and discern the manufacturer of each part by noting subtle differences in how the piece was machined or finished. This wealth of knowledge is due to the fact that the development and production records for the Garand were made available decades ago by the US military and the various manufacturers. Of course collector interest is also a factor. The Garand is one of the most collected pieces of WWII equipment and when you have thousands of collectors clamoring for detailed information the odds are pretty good someone is going to unearth the data. Since there can’t be more than a dozen serious collectors of Army lensatic compasses there’s a whole lot less clamoring. As an item of individual equipment that guided millions of Soldiers across the battlefields of Europe and the Pacific in WWII, and continues in use by our Soldiers today, I’ve always felt the history of the lensatic compass deserved better coverage. Earlier this week I was on a different quest. I recently purchased an interesting bit of Army topographic kit, a Vertical Sketchmaster (I’ll do a posting on that later). Since the device came without paperwork or documentation the first thing I did was hit Google for a quick search. Buried about three pages deep in the search results was a reference to a holding in the Defense Technical Information Center (DTIC) titled “History of [the] U.S. Army Topographic Laboratories (1920 to 1973)”. 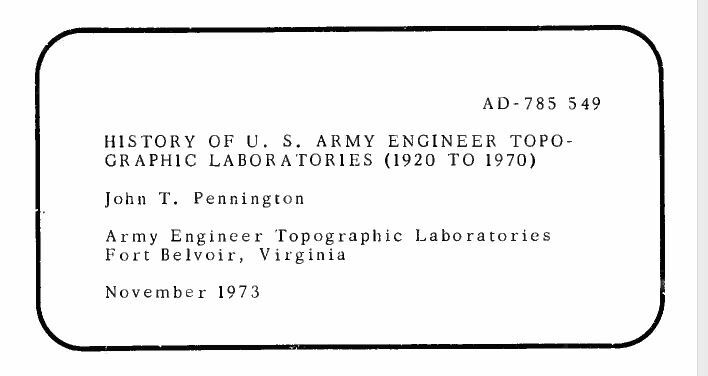 The phrase “Army Engineer Topographic Laboratories” got my immediate attention because the document could only be referring to what used to be know as the Army Corps of Engineers’ Engineer Topographic Laboratories, or ETL. ETL and it’s predecessor organizations within the Corps of Engineers served (and still serve) as the Army’s R&D lab for development of topographic, terrain analysis and geospatial systems, processes and equipment. Now called the Army Geospatial Center, it was an organization I called on many times during my career for support and advice, and they always came through. As luck would have it the document is available in digital form through Google. I immediately downloaded it and started reading. Published in 1973 as an ETL internal paper by John Pennington, it is a short rundown of the history of the Army’s topographic R&D labs and covers major projects and equipment development between 1920 and 1970. I don’t want to spend too much time on this document in this post, because I feel it deserves it’s own separate discussion at a later date. For now I’ll just say it is a treasure trove of historical information. While reviewing the document for information on the vertical sketchmaster I quickly came across discussion of lensatic compasses. This was something completely unexpected. I never considered that the development of the lensatic compass was something an Engineer topographic R&D lab would have been involved with. 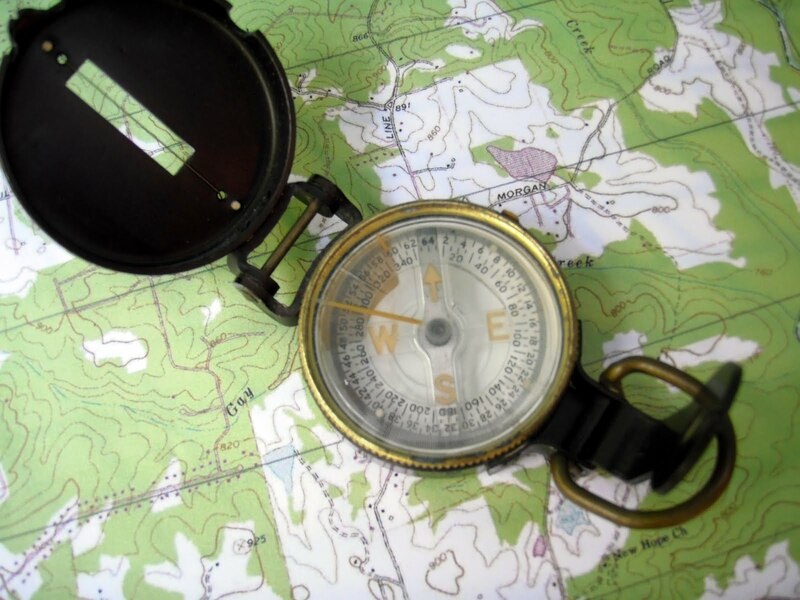 After reading the entries it now makes perfect sense – the Engineers had doctrinal responsibility for development of land navigation equipment and were the Army’s subject matter experts on compasses of all types. 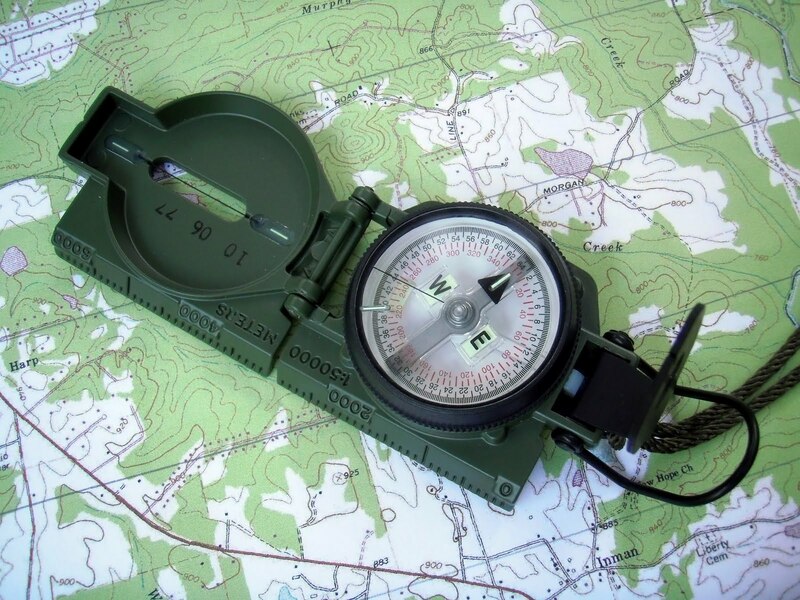 While the development of land navigation techniques including the use of map and compass was the responsibility of the Infantry School, development of the compass as an item of equipment was the responsibility of the Engineers. Of course the two branches worked hand-in-hand on the project, with the Engineers serving as a test and development agency in support of the Infantry School. “(7) Compasses. 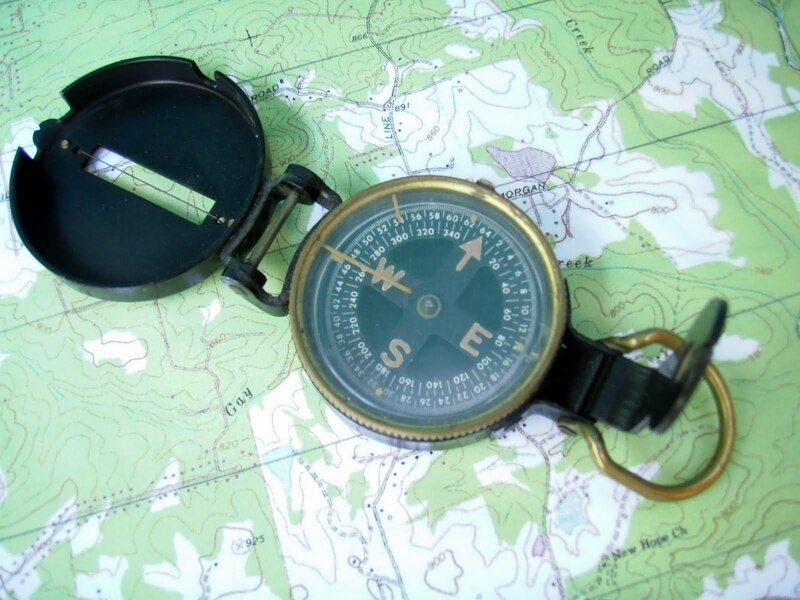 Although the compass is not strictly a surveying instrument, considerable effort was expended by the Mapping Branch of the Engineer Board in the World War II period on the development of small compasses for Infantry and other arms. The work started in 1938 when the Infantry requested that an inexpensive, commercial-type compass be found to replace the marching compass then issued because the marching compass was too large, elaborate, and costly. This investigation was assigned to the Engineer Board, and it was soon found that no suitable commercial compass was available. The W. & L.E. Gurley and the Taylor Instrument Companies, however, were willing to make a suitable compass based on a new design; and each company made six samples in 1939 as ordered from the Engineer Board. Thus we have the WWII-era M1938 lensatic compass. My question now is, was this originally a liquid filled model? Read below. One interesting point is that while lensatic compasses made by Gurley are fairly common (they were a major manufacturer of surveying equipment at the time) I have never seen a military lensatic compass made by Taylor Instruments. However, Taylor Instruments did go on to be a major manufacturer of wrist compasses for the US military in WWII. But the story is not over. Even back in 1940 they were struggling with the issue of how to dampen the compass needle or card. 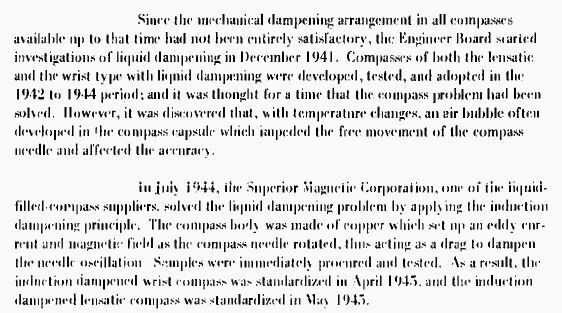 “Since the mechanical dampening arrangements in all compasses available up to that time had not been entirely satisfactory, the Engineer Board started investigations of liquid dampening in December 1941. Compasses of both the lensatic and the wrist type with liquid dampening were developed, tested, and adopted in the 1941 to 1944 period; and it was thought for a time that the compass problem had been solved. However, it was discovered that, with temperature changes, an air bubble often developed in the compass capsule which impeded the free movement of the compass needle and affected the accuracy. Based on the number of WWII compasses available for sale from auction sites like eBay I think that Superior Magneto was the #1 supplier of lensatic compasses during WWII. Knowing their core business – the production of magnetos – it makes sense that their engineers would have a clear understanding of the principle of induction and how to apply it to the problem of compass needle dampening. Today M1938 compasses with induction dampening are easy to identify. They have a white compass bowl that contains the compass card. The white bowl is the stamped copper cup that the compass magnet interacts with to slow oscillation. It is an excellent dampening system and is still used today in US military-issue lensatic compasses. M1938 Lensatic Compass with induction dampening. with the north-seeking magnet to reduce oscillation of the compass card. Let’s skip forward now to the late 1940s, when it was clear that the lensatic compass was in need of an upgrade. “(3) Compasses. The development of compasses, both the wrist and the lensatic types, was reopened in 1947 to provide instruments which would overcome the deficiencies noted in those developed during World War II. Experimental models of the lensatic compass were produced by Taylor Instrument Company, Rochester, New York (Fig. 84), and the Brunson Instrument Company, Kansas City, Missouri. 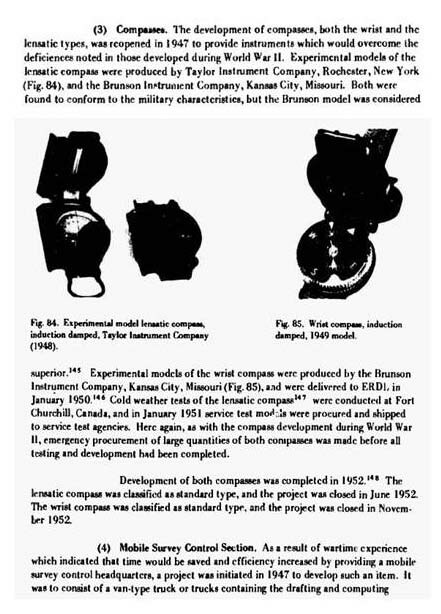 Both were found to conform to the military characteristics, but the Brunson model was considered superior. Experimental models of the wrist compass were produced by the Brunson Instrument Company, Kansas City, Missouri (Fig. 85), and were delivered to ERDL in January 1950. Cold weather tests of the lensatic compass were conducted at Fort Churchill, Canada, and in January 1951 service test models were procured and shipped to service test agencies. 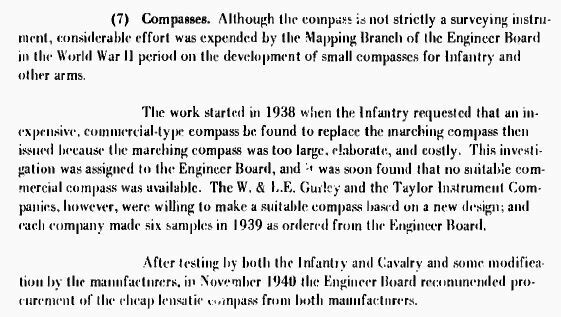 Here again, as with the compass development during World War II, emergency procurement of large quantities of both compasses were made before all testing and development had been completed. M1950 Lensatic Compass produced in 2010 by Cammenga. The M1950 is still one of the best compasses ever developed, and I consider it the best military compass ever issued to any military anywhere in the world. This entry was posted in compass, History, Military, Tools and tagged compass, lensatic compass, m1950 by Brian Haren. Bookmark the permalink.